This is a super tutorial. You really have a talent for instruction- you should take up teaching lapidary at a local communityy college. I'd pay for the tuition. Of course, it would be a long commute from Florida to class. By the way, I dfid a little research on "gold-filled" material a few days ago. I was interested in learning wire-wrapping and just got curious about the stuff. I had thought the interior metal had some god content, too, with a plated exterior, but Wikpedia describes it as the same as rolled gold, an older term for gold filled, apparently. They said it was done by fusing a sheet of a given carat weight of gold onto the base metal with heat and pressure- the rolling- and that the final weight of the material is supposed to be 1/20th by weight of the given Karat gold. For wire, I suppose a billet is prepared accordingly and die extrudedor rolled muyltiple times in multiple dierections to produce the finished product. So, 12 karat GF is 12K- 50%- of 1/20th of the total weight of the metal, or 1/40th, pure gold by weight. The process sounds lioke it was derived from that used for Sheffield plate silver, which predates electroplating by a few decades, with a sheet of sterling silver being fused to a copper base in a standardized proportion and the resulting sheet metal woked into finished pieces. Mark- funny thing, I actually did teach a wire wrapping class yesterday. There were three wire wrappers..... Me, Jeremy (Jurassicjonje), and a girl from North Carolina. We each took a group of people. It was alot of fun, me and my group joked around so much that it took us the longest to make the wire wraps but everyone did an awesome job All people were from the Tidewater Gem and Mineral society, I joined about 4 months ago. I've been up there a few times while I was on active duty, stationed at Goldsboro and Fayetteville, NC. I love that area, but never managed to get stationed at Langley. Do you by any chance know of a rock shop or online trader in Mount Olive, NC- pickle capital of the world- 15-20 miles south of Goldsboro? I bought some really great stuff from him a few months back but can't recall his name or find him on eBay. I'm not familiar with that area. I did some work in Goldsboro, but all I knew was from the Hotel to the job sites. We do have a decent rockshop here in Virginia Beach, and there's a really big pile of rocks outside (tons) that sell for $3 a pound. As soon as it warms up a bit I'll be digging through the pile again. Come on up! What part of FL are you in? It takes me 12 hours to drive from Orlando to Va Beach. Mark, the mans name is Harley Hines that lives in Mt. Olive(actually Beautancus) NC. I used to buy a lot of rocks from him when I lived in NC. Thanks very much! The name sounds really familiar- I'm sure he's the one. He had fantastic stuff on eBay and I haven't seen him there lately. i'll see what I can find on him. And, welcome to the RTH! , FL directly across the bay from Destin. i'm pretty much halfwway between Pensacola and Panama City. I'd love to get back up there again, but this kid thing and work thing and not driving thing are a bit of a problem (I don't see very well). I remember some great eats up there. There was a terrific Italian deli with deli baked Sicilian peasant bread and great imp[orted Italian cheeses. Their pastas were incredible, and the place was really plain and cheap. I don't know why I thopught of that place, just an association. If it;'s still there, check it out if you haven't. one of these days I'm going to take the kids to Olonial Williamsburg. It's something everyone ought to do, I think, if they can puyll the kids away from Busch Gardens long enough!. This place is a collectors' wasteland except for fossils, and I don't know where to begin looking locally (but they are there). it isn't too far up to the Hobbs mine (sp?) in LaFGrange eorgia and I have a lead on several locations a day trip from Atlanta like GravesMmounain. I have relativces up there I can intrude upon and it's only about 6 hours up there. I'm told there's stuff to be jhad neart Stone Mountain, too. Oh well, someday when the kids are grown and the dogs are dead, we'll take off. I'm planning a few hunting trips over spring break in East Tennessee for Magnetite, crinoids, tree fern casts, Douglas Lake diamonds, agates (some really beautiful stuff up there that rivals Lake Superior's best), and varuous lead and zinc associated minerals. A little ways west ad your finding great geodes in Jamestown, TN, aragonite and calcite. Of course, a quick overmnighter tatakes you to Spruce pine or Franklin, NC. Are you aware of anything in AMelia Courthouse that is still open to the public for prospesting? the Morefield mine at Amelia is now closed. You need to check out Dirtyrockhounds proboard. It is a digging board for NC, SC, Va. and Ga.
Also join MAGMA, it is free and they go to a dig every weekend somewhere. Last weekend was the Reel mine in NC. First time its been open in years. Graves Mtn is coming up soon. A florite dig to Marion, Ky is Mar. 27-30. Ken and I go on a lot of these digs. All three will get you to the same place. Ken was a SJAFB and lived in LaGrange and then Snow Hill. one of these days I'm going to take the kids to Olonial Williamsburg. That's 45 minutes from my house, you'll have to look me up! Thanks Donna and Randy! A very experienced rockhound/silversmith from my homoe town with a daughter my age told me the Amelia Courthouse digs were closed, but I thought there might be somewhere around there to hunt spessartite. oh, well- I am still planning to learn how to post pics and show you some of my stuff from Elmwood Mine, Carthage TN and a few ID stumpers. I am extremely new to all this. In fact I'm so new I've not polished my first stone... yet! I recently went to Moonstone Beach in Cambria, CA and I found many wonderful stones that would be perfect for pieces of jewelry so I've decided this might be a really fun hobby - I've always been a rock collector. I really liked the tutorial on wire wrapping. It gave a much more clear picture of what this is like. Are there any other resources, books, etc. you all would recommend? Also, some of my stones are pretty small, do any of you use something like Dremel tools to polish with instead of tumbling - I'm afraid tumbling would completely dissolve some of my stones. Any tidbits of info will be helpful. And oh, Mark H. - Carthage TN is very close to where I grew up! Welcome KT, glad to have you! I think you'll really like it here. Some moonstone is tricky to tumble. I would start with something harder like jasper to get your experience with tumbling before trying moonstone. Moonstone is a little softer, a 6.5 on the Mohs scale, vs. Jasper which can be anywhere from a 7 and higher. Also, the characteristic cleavage in moonstone can make it a challenge. If you want to try using your dremel, you can use the sandpaper, grinding bits, or diamond bits in increasing grits to shape and smooth out the rock surface. Then, using one of the buffing bits and a polish, such as diamond paste, you could get a shine. Thanks for the info. I know that some of the stones I found are moonstone but I have other things as well... I'm not really sure what all I do have. There is one stone that is a dark reddish color and the shape is already great for a pendant - with just a little shaping needed. Do you know of any good books or resources for learning how to identify stones? Best way to ID stones is to post pics on the Identification forum of this board. Identification forum! That's great - I'll have to get some pics and post them. Thanks. Great tutorial, Randy. Somebody told me to practice first with craft wire or copper. Do I have to do that? What about cabs that aren't oval? I have a pretty chrysoprase with matrix that looks like a heart. I guess the same thing happens, but it just turns out differently because of the cab shape. I'd better start with oval cabs. How did you take such fantastic photos? Welcome to the board! Craft wire is terrible stuff for trying to learn with, I highly recommend copper wire from Brandywine. It works just like gold wire. It doesn't really matter what the shape of the cab is, some can be a bit more challenging though, especially if you're a first time wrapper. 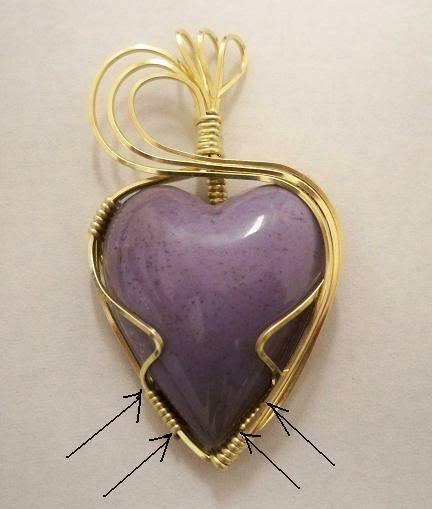 A heart is just as easy to cab as an oval with one difference.... instead of starting with one binding wrap in the middle, you'll start with two. They'll have a space of approx. 1/4 inch between them, with a 90 degree bend. That will be the bottom of the heart. Everything else will be exactly like the tutorial. Here's a heart that I did last month, you can see what I'm talking about. Note where the arrows are, this is the primary binding wraps. The one at the very bottom on the right is the very last bind. Randy, just wanted to post a little thanks for this tutorial. I printed it out and sat down with it last night, and ended up with a great looking wrap (I'll take pics later) in less than 1/2 an hour. I normally really struggle with my wraps and they take forever. This one was smooth as buttah! You have inspire me to give it a try. Your photo's are very detailed and clear and your step by step makes sense and easy to follow. So I just order some copper wire to give this a try and all I have to do is get a cab to use. I will check the local mall they should have one there. I joined this board just so I could comment on this EXCELLENT tutorial. I have one that was free from a site (can't remember which one) but it is nothing on this one. I'm part of a group of jewelry designers and I posted a link to this tutorial on our board and they were so happy I did. I did my first cab wrap ever and I was actually pretty happy with how it came out. Still need to take a pic of it but mainly just wanted to add my kudos to you Randy on this tutorial.